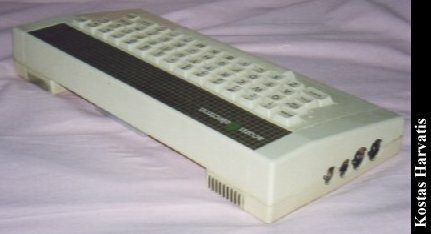 Little brother of the famous (at least in Europe) Acorn BBC micro. Bought it about 12 years ago. Now I'm glad that it was the Electron and not the CPC464. Featuring the 6502 processor, 32K or RAM and 32K of ROM. Basic and assembler included! The powerful BBC Basic with features taken from Pascal and direct access to the OS. Three video outputs onboard: TV, CVBS and RGB. And the tape recorder connector of course. No other interfaces whatsoever. There were 2 main expansion units (for the big connector on the rear): The Plus 1 with RS and parallel interface and the Plus 3 with a 3.5" 800K disk drive. Also available multiple EPROM programmers, RAM expansions etc. Click here to view all comments for the Acorn Electron and to leave your own. Click here to view comments about other Acorn computers.